What is the role of women in the Kingdom? Am I inherently less competent or disqualified from certain things just because I was born as a female, destined to be supportive/accessory to malekind’s greatness? Being nothing without a man (husband) to complete me? Meant for nothing more than stereotypical wifely and motherly duties? Is any ambition to be more than this vanity and conceit, in the same way that Lucifer aspired to be like God? See 1 Cor 14:33-34; 1 Tim 2:12; Eph 5:22-24; 1 Tim 2:11-14; 1 Cor 11:3-10. What does it mean when the bible says: “God created man in His image”? How do we know it means that we have a similar nature to God, or what parts of our nature are like God’s? Is God under a different moral law than humans? Surely there must be things that remain objectively, universally good or evil? Is God, as a necessarily wholly good being, not under these things in the same way that we are? If not, then what are the exceptions where He is under a different law than we are? It is written of the Original Sin that the serpent deceived Adam and Eve. How can they be held responsible for this ‘sin’ then, when they were (before eating of the tree of knowledge of good and evil) ignorant of right and wrong? When confronted with the problem of evil, the answer I have typically seen is that of the Fall. As far as I have been taught, this is a complete fall of both man and the universe. Now I have been taught that a person has three parts to them: the body, the soul (some may prefer to use the word “mind” instead) and the spirit. Firstly, is this model of tripartite personhood biblical? Secondly, if we look at each of these parts they should be fallen. It is obvious to me how the body is fallen (the existence of disease, for example). The soul/mind… this is more complex because although our rationality is subject to biases and we have limited knowledge (and capacity), our knowledge/capacity was even less before the Fall. Thirdly, how can we tell that the spirit of man is fallen? From the sinful impulses of their heart? If so, then man was already in a “fallen” condition before the Fall because that impulse to commit the original sin had to have come from somewhere. I think we need to differentiate here between having moral knowledge, and having a certain kind of experiential knowledge by acquaintance. I do not think the fact that God forbid Adam and Eve to eat from the tree of knowledge of good and evil refers to fact that they would gain ‘moral knowledge’ in doing so. They already had such moral knowledge in virtue of being created moral beings that could appropriate God’s commands. If this weren’t so, then God could not have commanded them not to eat from the tree, since they would have been unable to distinguish conceptually between ‘right’ (obeying God) and ‘wrong’ (disobeying God). So I would say that the tree of knowledge of good and evil is the author’s way (a literary device, if you will) of referring to having a certain kind of experience that God did not want Adam and Eve to have, and that would be the result of their disobedience. Think of it this way. I know that torturing my cat for fun is morally wrong (I possess moral knowledge of this fact by virtue of being a moral being) without ever having actually tortured any cat or seen any cat tortured (I am not experientially acquainted with the immoral act of torturing cats for fun). With regards to the morality of torturing cats, it can therefore be said that I have definite moral knowledge without having to have “eaten from the tree”. If you accept a dichotomous nature of man, as I do, then the idea of our “spirit” refers to our ‘orientation towards God’. The fall of man into sin, did indeed affect us holistically, but most importantly it meant that our relationship with God was severed. Because of sin we are/were orientated away from God and towards ourselves. Because of sin our capacity as rational beings is hindered by self-serving biases and desires. Was it a sinful impulse of the heart that motivated Adam and Eve to disobey God? No, their disobedience wasn’t prompted by a sinful or evil impulse, but by a desire for a lesser good (the purpose of the Serpent’s temptation) instead of the greater good of staying dependent on God (i.e. trusting Him for meeting their needs). I think I understand the given answer. However, it opens up a door to more questions. I will be addressing the ontology part first, because the function part comes from this; the function cannot be properly addressed if it is built on a false notion of the ontology.Initially, I thought, “Yes, I have heard this before. God is personal. Man is personal. But which parameters define ‘person’? What are these ‘essential attributes of personhood’?” According to William Lane Craig the necessary and sufficient conditions are self-consciousness, rationality, and freedom of will. This is difficult because it seems to exclude infants and the mentality handicapped, but we do not think of them as being non-persons. If we say that our esteem for human life is because we have been made in God’s image (ie: we are personal), then this definition leaves loopholes for things like euthanasia, infanticide and abortion. Also, what of angels and demons? Are they personal? Made in the image of God? The article was helpful. Good exceptions were given. I wonder how the exceptions intersect with the different types of law (moral, ceremonial, civil, judicial)? Conceptually, I see how He is exempt from all of these categories (as these laws were made for man), except the moral law. If we look at individual laws, it allows us to be more clear and specific. Therefore, I have looked at the ten commandments because they seemed the least disputable example of law that falls into the moral category. I take no issue with commands 1-5 because these are clearly not applicable to God. Command no. 7 is beyond my capacity to imagine in this context. However, just because these are not applicable to God, does not instantly mean that the rest are not either. We are left us with commands no. 6, 8-10. No. 9: God does not reveal whole truth to us. Only partial. There are some who would call this a lie of omission. So, is God breaking no. 9, or are we incorrect in thinking that such a thing as a lie of omission exists? No. 6, 8, 10: these are dependent on the concept of possession. If we assume that God owns everything, then these are also not applicable. But I wonder… does being the creator of something necessarily mean you own it? Is it possible that persons (as defined above) can be autonomous in some way: in their freedom of will. We own our choices, not God*. Otherwise we could not be liable for them. Thus God can hypothetically covet our assent to His grace. God can steal someone’s choice by hardening their heart (so they are forced to decide in a certain way). And murder: Though He has supplied the matter out of which we are made, as well as our spirit; though He has given us our will, He has surrendered it as a gift. It is now ours. Despite this, if He kills us, He kills our future choices with us–something He did not own. Even if you assume ownership, I’m not sure this absolves you of your moral obligations. For example: you can own a cat, but torturing it is still wrong. I think it matters why we think murder is wrong. If you assume it is wrong because you mustn’t destroy someone else’s property, then there is a strong argument exempting God from being guilty of murder. On the other hand, if you think that murder is wrong because of the inherent personhood of a person (their consciousness, rationality and free will) and that there must be a basic respect for that, things become fuzzier. My value and respect for people comes from the latter idea. It is also why I am not a vegan–I don’t mind the idea of killing non-persons (like animals and plants). If I had believed the former idea (God created them and God owns them), it would be disturbing to take plant and animal life. I wonder now if my ideas are built on false foundations. It is also remarkable to me that Greg Koukl states: “makes God subject to His own rules in a way that puts the rules above God instead of God above the rules”. I was wondering if there are not rules that He is subject to in this way. I’m not referring to the rules in the law that He gave us, but other unnamed ones. For example: the necessity of sacrifice/blood as payment for sins before forgiveness can take place. If someone murders your daughter, surely you have been wronged. But God tells us simply to forgive without any repayment or sacrifice. However, God does not and cannot simply forgive us and accept us back into His holy presence. There is some law (as CS Lewis puts it, “deep magic”) which requires blood to atone for wrongs. This law seems to state that sinfulness cannot approach holiness; so we could not be reconciled to God (though He wanted it) without sacrifice. Another instance of some law binding God is indicated when Jesus insisted he had to go (ascend) in order for Another (the Holy Spirit) to come in His place. Why could God’s physical presence in Jesus not coexist on Earth with God’s manifest presence through the Holy Spirit in us? In the way that we are bound by certain things like the laws of physics and time and laws of causation, is not God bound by some laws as well? We take our laws of this nature for granted to be inescapable. But in the realm God inhabits (if there is such a thing) may not be under laws like dimension, gravity and time. Does this “realm” have laws to it that God has to obey? I acknowledge that I have deviated off topic since these laws are not moral laws, but I hope you can follow my stream-of-consciousness-style train of thought to how I came to be asking these questions. *Or do we? What is your take on the good ol’ Calvinist vs Armenian debate? I understand the difference between moral and experiential knowledge. However, as far as I understand your response, you seem to be begging the question. I asked how Adam and Eve can be expected to be obedient or be responsible for their disobedience without moral knowledge. I interpret your reply as: they must have had moral knowledge, because then otherwise they could not be expected to be or accountable for their obedience (or disobedience). Is this not a logical fallacy? Furthermore, it seems to me a bit of a hermeneutical stretch to say that the tree of knowledge of good and evil did not bring knowledge of good and evil. So if it brought experiential knowledge (not moral, because supposedly they already had that), then what did they learn of goodness? Gnawing at my mind and supporting this argument is Jeremiah 31:31-33 (short version: “I will put my law in their minds and write it in their hearts”). It refers to an event in time after Adam and Eve. It seems to refer to how we now have a moral conscience; to the convictions of the Holy Spirit in us. Is it wrong to think that the law was not written on the minds and hearts of the people before then? If, as you said in your response to my question 5, Adam and Eve’s disobedience was not prompted by a sinful desire, then why is it a sin? Assuming they had the moral knowledge to know that obedience is right and disobedience wrong, yet also being innocent and lacking experiential knowledge, how should they know who to obey/disobey and who to trust/distrust? They had no experience of anything or anyone to distrust, assimilating every new bit of information as truth. So, being told that a) they would not die, and b) it would make them wise, this seems like a reasonable decision–a decision made by an ignorant and deceived individual. Then later in Genesis 3:22, God Himself is quoted, “The man has now become like one of us, knowing good and evil.” Thus the knowledge of good and evil cannot merely be a linguistic device limited to the author (inspired by God, but put into words by a human author), because this direct quote of God again refers to the knowledge of good and evil. If this gained knowledge of good and evil is moral in nature then it pokes holes in your argument, and if it instead refers to experiential knowledge then this is problematic too. Because God (who is good and perfect) cannot have firsthand experiential knowledge of evil. I feel this response of mine is quite haphazard and disordered. It gives me a sneaking suspicion that I have misunderstood you, so I apologise if so and hope that you will set me straight. Wow, I’m really glad I asked! You referenced some rather convincing literature on the dichotomy of man.Otherwise, I feel I have partly replied to some of these issues in question 4, but I clarify and reiterate here. Take an innocent Adam and Eve who have a limited concept of morality (assuming they even have moral knowledge, as you said). How are they supposed to distinguish between many of the complexities in right and wrong, let alone between the more nuanced good and greater good? And then this ‘good’ is referred as the Original Sin, some sin greater and more notable in offensiveness than others. If they were deceived, surely they thought what they were doing was right. It was not an act of rebellion, yet they are treated as though it was. Of course, in our society, ignorance of the law is no excuse. I am largely convinced, but most of question 4 and 5 are questions posed to me by another friend. I want to be as thorough as possible in trying to see the problem as I think he would see it and trying to see it how I think you see it. So that hopefully I understand the both of you and more clarity can be achieved on the subject for my friend and I.
I respond to your points. Yes, angels and demons are personal beings. Are they made in the image of God? Well, if the image of God refers to the attributes of personhood and if angels (or demons as fallen angels) exhibit these attributes (as Scripture seems to indicate), then one could reasonably conclude (although this is nowhere explicitly stated in scripture) that they too were created in God’s image. I would again emphasize that God doesn’t have moral obligations, since He doesn’t issue commands to Himself nor is He subject to any laws. God is perfectly good by nature and whatever he does necessarily flows from his goodness. So I don’t think that the 10 commandments apply to God. But let’s look at your concerns. I’m not sure what you mean with “God does not reveal whole truth to us”. You’ll have to explain a bit more or give examples. But I can imagine a situation where giving partial truth is not a lie of omission, but intended for preparing the listener to receiving more truth as his capacity to understand increases. How you answer your three-year old child who asks a difficult question will not be the same (in comprehensiveness and clarity) as you would when asked the same question by your ten-year old child. Just ask any parent who has had to answer the perennial “Where do babies come from?” at various stages in their children’s lives. I think it’s intuitively correct to think that you own what you create, except if you explicitly renounce such ownership. But what is the situation with autonomous beings being created by God? Let’s explore the question from a different angle: Can I as an autonomous but created being, recognize that I ‘belong’ to my Creator? Consider the following. It’s not difficult to see that when you recognize that your life was given to you as a gift, that the appropriate response is that of gratitude. It’s also not difficult to think that your Creator might have had a purpose for giving you the gift of life and that it would therefore be wise to seek out such purpose; presumably such purpose gives meaning to your gift of life and leads to true flourishing. So I can intuitively recognize that my autonomy does not entail existing independently of my Creator. Rather my autonomy is based on my ability to choose to stay dependent on God precisely because he is my Creator. Therefore it wouldn’t be strange to view myself as belonging to my Creator. On this view I recognize that God’s ownership implies care and concern for the well-being of self-conscious and free-willed creatures as ourselves. I don’t find meaning in the notion of God stealing anything from us (command 8), much less “coveting our assent to his grace” (10). He doesn’t ‘covet’ such assent, He wills it for our benefit. The idea of “owning choices” is also at best a category mistake. You don’t ‘create’ or ‘own’ choices, you ‘consider’ or ‘make’ them. But what about murder? Is God guilty of ‘murder’ when he kills a human person? Here the obvious question to ask is: does God ever take a human life with malicious or capricious intent (the definition of murder)? Or is it rather the case that God has morally sufficient reasons (because he is all-good and all-knowing) for taking human life when he does so? And if God will restore all life in the afterlife anyway (those who will live with God forever as well as those who won’t), then taking a life in this short earthly life for morally sufficient reasons, does not seem particularly problematic. The instances you mention, the ‘law of atonement’ (my wording) and the outpouring of the Holy Spirit after Jesus’s ascension, are not examples of God being subject to a higher law. They are only necessary because of this specific world that God chose to create, a world such as existing of these particular physical properties functioning according to these specific physical laws. These things are the way they are for the benefit of us as particular kind of created entities, and not because God couldn’t have made a different world with different properties and entities and therefore possibly different laws. You ask why Jesus and the Holy Spirit couldn’t coexist on earth. Well, I see no reason that such couldn’t have been the case. But it might simply be the case that God knew it not be necessary or even that it would be undesirable for particular reasons. The fact that we are not told what these reasons are, doesn’t mean there aren’t any. Then, what God can do or create isn’t limited by anything outside of Himself. The only constraint on God is what is determined by his nature. God is perfectly good, therefore he cannot do anything evil. God is a rational being therefore he cannot create square circles. Things of this sort. But these are not really ‘limitations’ in any real sense. Deel 2: Vergifnis en versoening: Is daar ŉ ander manier? Deel 3: Vergifnis en versoening: Wat verander? I would have expected nothing less from someone involved with Dialoog to apply their critical thinking skills and look for logical fallacies. There has been no logical fallacy committed on my side, though. My response was to point out the problem with the assumption you made, that Adam and Eve didn’t have moral knowledge (such is, to put it in formal terms, the fallacy of begging the question). I tried to make you aware of the fact that if Adam and Eve were expected to obey a moral command, then it necessarily presumes the ability to make moral distinctions, but making moral distinctions depends on having moral knowledge. So, Adam and Eve must have had moral knowledge prior to the fall and that is why they are liable for their act of disobedience. Let’s talk about the ‘hermeneutical stretch’ you seem to think I’m making. You seem to think that my interpretation is suspect when I say that eating from the tree of knowledge of good and evil did not bring knowledge of good and evil. But I specifically explained from the wider context of the story (thus trying to be hermeneutically responsible) why it is problematic to view the act of ‘eating from the tree of knowledge of good and evil’ (which I regard as literary device to make a particular point) as bringing about moral knowledge. In fact, I didn’t say it did not bring knowledge of good and evil; what I said was that it brought about a certain kind of knowledge of good and evil, but which God knew would be to their detriment. So again, by eating of the tree they gained experiential knowledge of the awful nature of evil precisely because it stood in such stark contrast to goodness (evil cannot exist or be mentioned without their first being something good). The impact of this moral experience can be seen in how it made them hide and feel ashamed. This feeling of guilt can only be the result of experiential knowledge of doing someone wrong, it doesn’t come from simply knowing that something is wrong. Maybe there is reason to think that this interpretation is wrong after all, but there is nothing obviously suspect considering some of the other factors in the story. So, Jer. 31:33 does not refer to our moral conscience, but rather to the work of the Holy Spirit under the New Covenant. But, yes, we do have a moral conscience (see Rom. 2:14), in fact, Adam and Eve had a moral conscience (which imply moral knowledge), because to be human is to be a moral being (ontologically). You ask: “If Adam and Eve’s disobedience was not prompted by a sinful desire, then why is it sin?” Disobedience is a sin because it violates God’s command. Period. Again, I see no reason to think that Adam and Eve were prompted by a sinful desire. They should have stood firm in obeying their Creator simply because God commanded it. But in this specific case, having felt tempted to pursue a lesser good (having ‘all knowledge’, Gen. 3:5) instead of pursuing the greater good (obeying God), wasn’t born of an evil desire, but a misguided desire, informed by deception. By the way, I find it strange that someone would think that Adam and Eve wouldn’t have known to obey and trust their Creator who communicated his will to them. Furthermore, the necessary and sufficient condition for ‘knowing to obey’ or ‘knowing to not disobey’ isn’t experience but moral knowledge. In regards to Gen. 3:22 where God says: “The man has now become like one of us, knowing good and evil.” If Adam and Eve gained limited experiential knowledge (not moral knowledge) of the nature of evil by their act of disobedience (of which they would not have otherwise known*), then this ‘knowing good and evil’ in verse 22 seems to refer to God’s knowledge of the true nature of evil. But of course, God doesn’t need experiential knowledge of evil to be able to know its true nature; He knows the true nature of evil by virtue of being God, that is, by being all-knowing, morally perfect and the creator of all good things. (*Again, we don’t have to experience a specific evil to know that it is evil, like my example of torturing a cat tried to demonstrate). I’m not inclined to think that Adam and Eve in their state of innocence (i.e. pre-fallen state) would have had a problem with the complexities of morality, nor that they would have had a limited concept of morality. I think it is us who struggle with such complexities precisely because of our fallen state, because of the pervasive and cumulative effect of sin on every aspect of our lives. 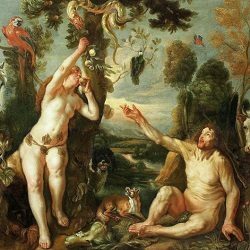 Did Adam and Eve think they were doing right in pursuing a lessor good? Well, that’s just the nature of deception: misleading you to think you’re doing the right thing, but which under scrutiny isn’t so. But this does not count as an excuse if knowing the greater good was available to them (as I think it was) and if pursuing the greater good was always a real possibility (as I think it was). So, although they were deceived, they were not externally compelled to disobey God; they could have done otherwise despite the serpents influence, so that their act of disobedience was all their own. I understand your desire for clarity and I’m under no illusion of any exceptional ability on my part of being particularly clear and precise. But hopefully as we wrestle together with some of the issues involved we can get some degree of clarity on at least some things.